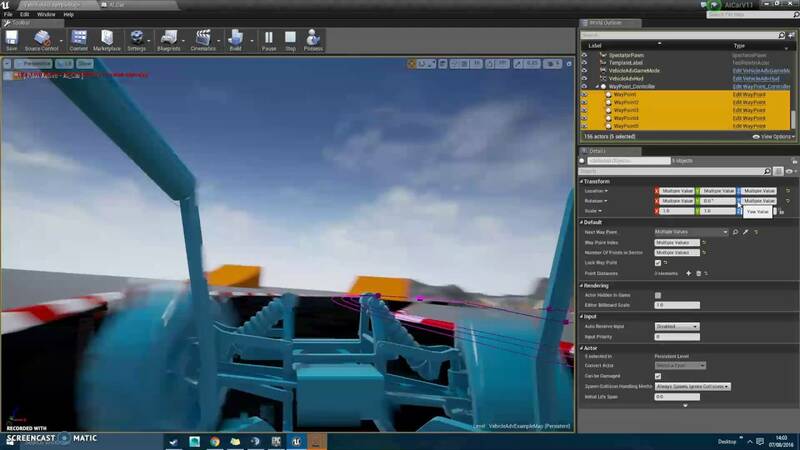 So i am creating a racing project for my last year at Uni At first I was going to use the other engine that starts with a U, but then i tried Unreal :P. This is my first Unreal Project so its all wip/learning . Anyways I was going to code the AI in C++, but i really like the easy control and debugging of blueprints, so I decided to use them . 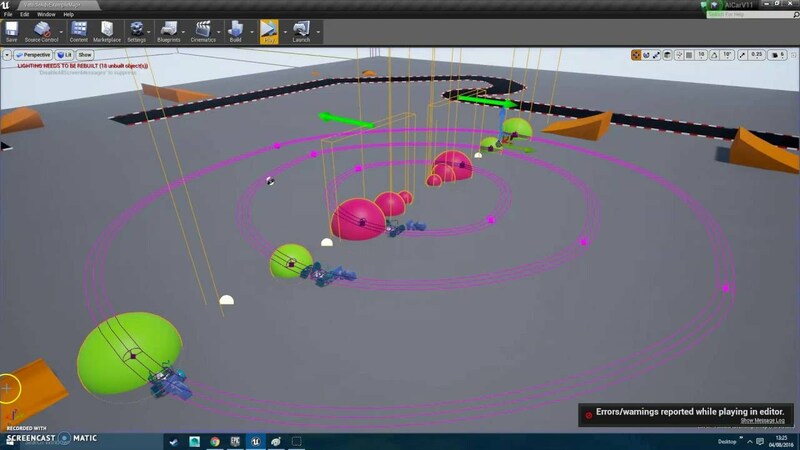 I haven't found many references for Unreal Racing AI so this system is built from the ground up. 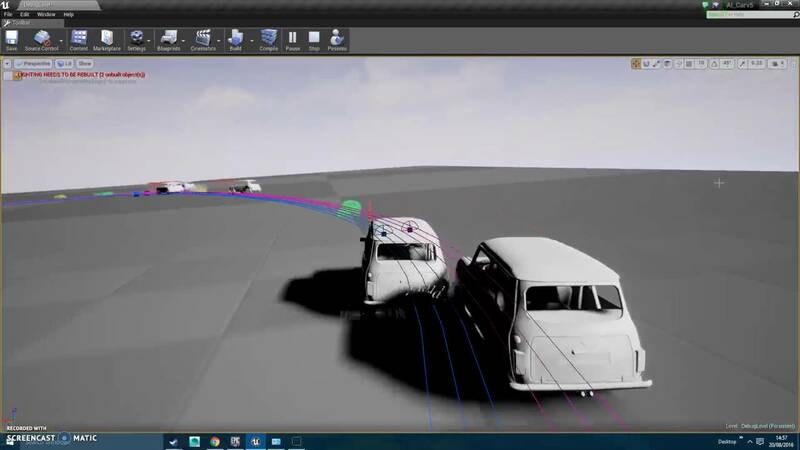 The AI controls the advanced car example, and uses all the same inputs a human player would use. The system currently uses just one lane. The user adds some way points along the track and then fine tunes splines between these tracks. Any suggestions or tips would be greatly appreciated, please scroll down to see how the AI has been implemented. Last edited by StonedRhino; 08-19-2016, 12:23 PM. (I am currently updating the logic so cleaner racing lines are produced and less user input is required). I do plan on making this available to the public, but my main priority is getting it finished for Uni(Next year) . Last edited by StonedRhino; 07-16-2016, 01:57 PM. Last edited by StonedRhino; 08-04-2016, 09:55 AM. Its been a while since I updated this post, but I have been working hard :P The project became overly complex and required to much input from the level designer(Maximum corner speed, Braking Zones, etc etc...) So I decided to take the project back to basics. 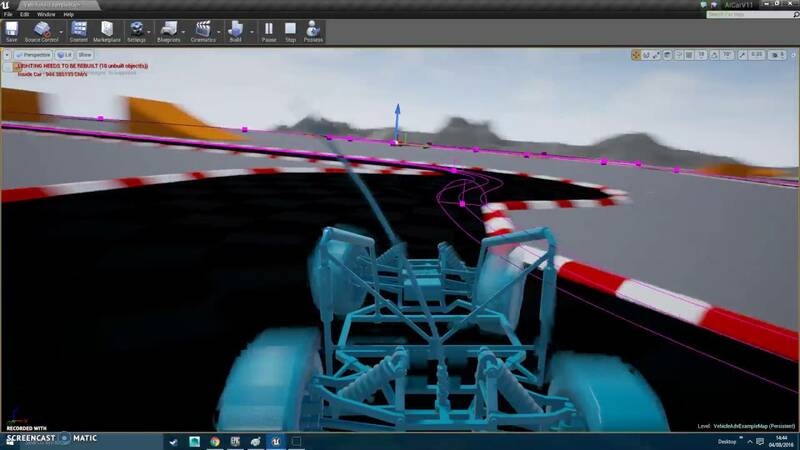 The racing AI will now use the spline to calculate maximum cornering speed, to brake or accelerate accordingly! And Finally A video of the AI doing some laps on the freshly created track. Last edited by StonedRhino; 08-20-2016, 08:58 AM. So I have completed the logic that stops the AI driving backwards around the track, this turned out to be a little more complex that I thought as the track is made up of multiple splines. But it works now so I am going to move on, the logic compares a distance along a specific spline and the cars distance along the spline. The car is then only allowed to accept a steering target if the distance conditions are correct, if they are not then the car will attempt to drive back to the closest track point. Here is a video showing the system in operation. I started the car backwards on the track, set the tire data incorrectly and added obstacles placed to make the AI crash and flip. 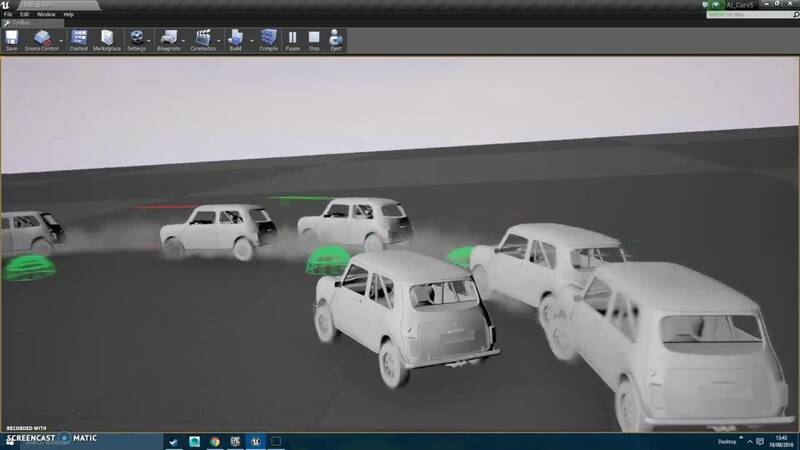 The video shows the AI crashing multiple times and then rejoining the track(in the correct direction). I have also completed the 'flying stabilization', this just stabilizes the car so it does not flip while in the air. The video below shows the same track with the obstacles removed, and tire info set correctly. Last edited by StonedRhino; 08-19-2016, 09:12 AM. As the subtitle suggest I have rebuilt the entire system again to give better results. Laying down the spline track is now easier than ever! Adjustments have been made so that cars more accurately determine the maximum corner speed. 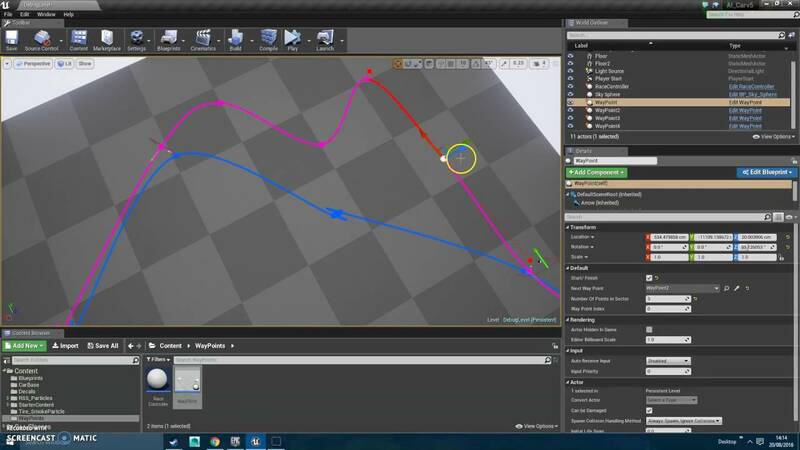 The racing is now made up of a single spline, allowing for simpler codes(blueprints). I have also added some better overtaking conditions, there is now a single 'race controller' object that each car references and queries to find out whether it should overtake or defend its current position. A Video Of me Laying down a bran new track! A Video of the AI racing the bran new track! 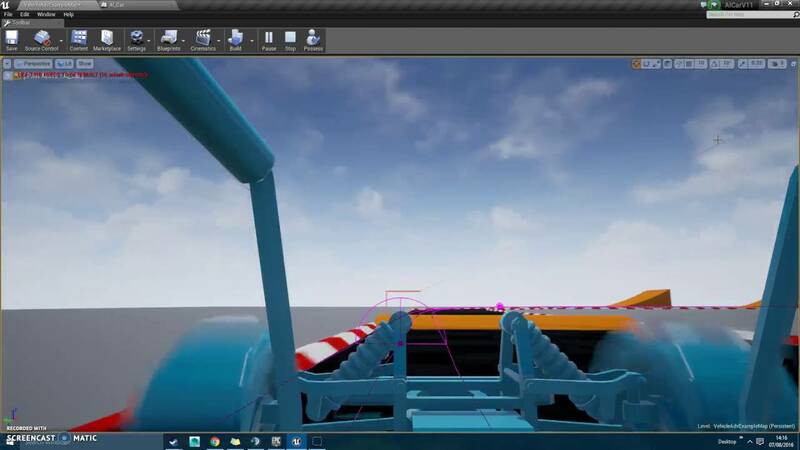 A Quick Screen Shot Of the Racing AI blueprint, Im still not sure if i want to show full resolution screen shots. Next Thing's To Do : Local Obstacle Avoidance, Better Lane Changing Control (Sometimes the AI Will spin out when attempting to overtake), Better Car senses in general(Are we skidding, understeer/oversteer etc). Last edited by StonedRhino; 08-20-2016, 10:25 AM. Do you plan to release this project or make a tutorial? I'm in search for something like this! You should put it up on the Marketplace. I'm sure it would sell like hotcakes. Is this still being worked on. It is quite interesting.